- Have you ever seen a color so vivid, so intense, that it just took your breath away? That's how we feel about our Butterfly Suncatcher. The teal glass is simply luscious, and will make a lovely spot of color in any window of your home. And when the sun hits it and the light comes pouring through… oh, my! Let the Butterfly Suncatcher lift your spirits whenever you are feeling down in the dumps. It's a little bit of garden therapy, and you won't even have to get your hands dirty. We also recommend using this suncatcher to brighten someone else's day! 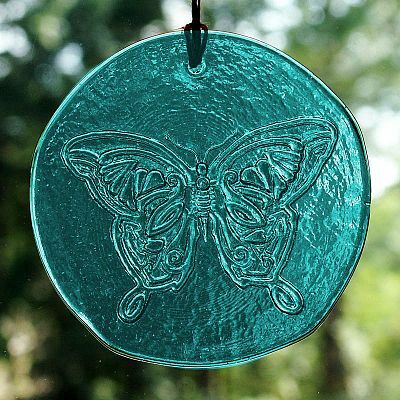 The Butterfly Suncatcher makes a thoughtful and affordable gift. But don't forget to keep one for yourself as well! The Butterfly Suncatcher measures approximately 4" in diameter. It comes with a hemp cord and glass beads for hanging. 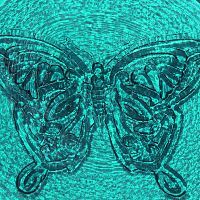 In many cultures all across the globe, the butterfly symbolizes Life and the Soul. It carries with it a message of hope and renewal. Have you lost someone close to you recently? 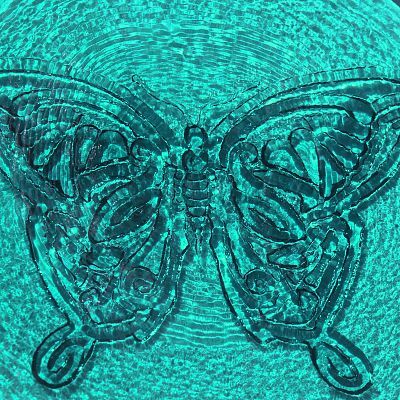 Look for butterflies! If you see one, it may be a sign that your loved one is still nearby and watching over you. Butterflies can be a reminder to keep things light and joyful. They may represent freedom, growth, and transformation. Also, according to color psychology, teal is a restful color that promote emotional stability, creativity, and healing. What makes your suncatchers special? This glass suncatcher is made for us by the St. Vincent de Paul Society. It is made from recycled glass. The foundry uses the money raised from their sales to assist homeless and low-income people through emergency services, housing, jobs, training, and other charitable endeavors. How cool is that! Do you have any other questions about our Butterfly Suncatcher?